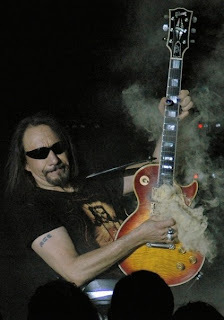 The Journal News reports former KISS guitarist Ace Frehley’s Yorktown, New York home may be in foreclosure. A bank is accusing Frehley of not paying the mortgage on his home for almost two years. U.S. Bank National Association claims that the rock star, whose real name is Paul Frehley, stopped paying his $735,000 mortgage on March 1, 2011. In its February 15 foreclosure filing, the bank asked the court to order a sale of the home to pay for the outstanding principal of $703,581.48 plus interest, late charges and other expenses.